Resistance to antibiotics poses major threat to public health – warns the WHO, and announces that the World Antibiotic Awareness Week (WAAW) in November will be devoted to this issue. In this context, it is worth noting that a team of young Polish scientists, the majority of whom are laureates of ADAMED SmartUP, has been conducting promising research on resistance to antibiotics for one year. In November last year Dr Margaret Chan, the Director-General of WHO warned that “the rise of antibiotic resistance is a global health crisis, and governments now recognise it as one of the greatest challenges for public health today. Her words coincided with the research conducted by, among others, Olga Grudniak, Filip Krawczyk and Marcin Pitek – the laureates of the 1st edition of ADAMED SmartUP programme. Together with their colleagues from a team led by Prof Michał Obuchowski from the Intercollegiate Faculty of Biotechnology at the University of Gdańsk and Medical University of Gdańsk, they are working on the issue of the antibiotic resistance of bacteria. The results of their research will enable the development of a new therapy method that can be an alternative to antibiotics. 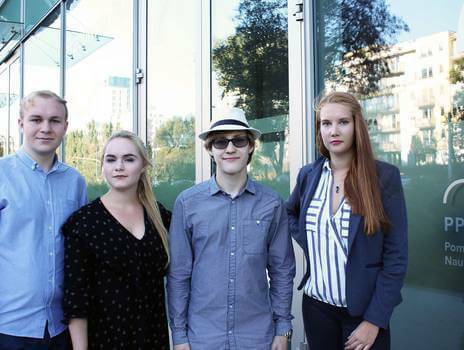 The project of the three young researchers from Tricity involves a modification of the Escherichia coli bacteria so that it produces an intended biomolecule able to destroy pathogenic cells. Although the study began with developing a biomolecule that can fight Staphylococcus aureus, it also assumes creating others which would be adjusted to other pathogens. The project of the young scientists has earned them recognition not only in the scientific community but also in the media. Two Polish magazines – ‘Kurier Gdyński’ and ‘Puls Medycyny’ – have recently published detailed, full-page articles on the research. “Five Gdynia residents have been working on an antibacterial drug that is an alternative to antibiotics for one-and-a-half years. They devote all of their free time to the work – even during the holidays! Their work has been appreciated – recently their project has been placed under the auspices of the Polish Ministry of Health,” stated one of the magazines.